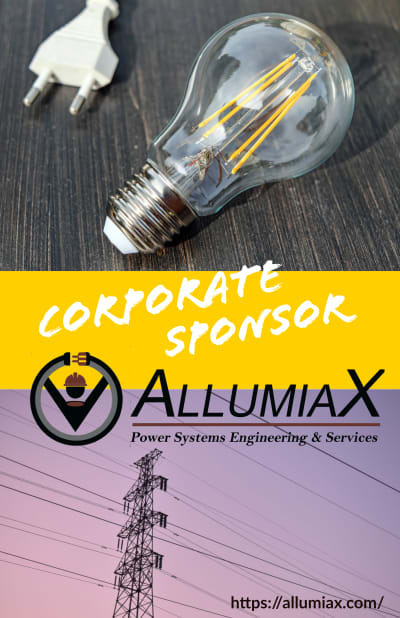 In part 3 of the series, we introduced line currents and phase current for the Delta Wye transformer connection. 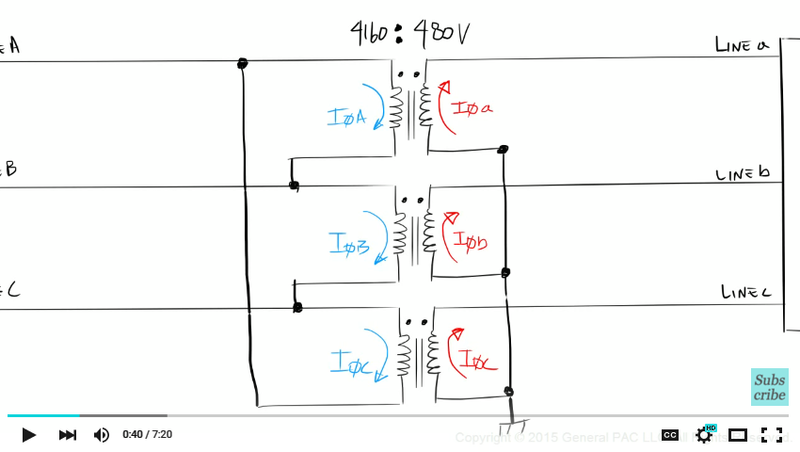 In part 4, we'll explore the relationship between line current and phase current for the Delta Wye connected transformer. We understand from Part 3 that, primary phase current A, B, and C currents flow through the polarity side of the primary windings. And the secondary phase a, b, and c currents flow out of the polarity side of the secondary windings. For wye connected transformer, it's very easy to see that line current and phase currents are both equal. Checkout the resources section for more information. However for the Delta connected transformer, we don't have the same one-to-one relationship between line currents and phase current. To understand this relationship, let's label a few things to be very clear and very concise. We will call Node A1 the node that connects the polarity side of winding A and the non-polarity side of winding C. We'll call Node B1 the node that connects polarity side of winding B and the non-polarity side of winding A. And lastly, we'll call Node C1 the node that connects polarity side of winding C and the non-polarity side of winding B. We know from part 3 that primary phase A current will flow into the polarity side of winding A and out of the non-polarity side of winding A. Which means that the current which flows out of node A1 by definition is phase A current. And since the non-polarity side of winding A is connected to the polarity side of winding B, the current that goes into Node B1 is the same phase A current. This makes visual sense right? Since we defined primary phase A current as the current that flows into the polarity side of winidng A and out of the non-polarity side of winding A, the current that comes out of Node A1 and the current that goes into Node B1 is the same primary phase A current. Let's now move to phase B current. We know from part 3 that primary phase B current must flow into the polarity side of winding B and out of the non-polarity side of winding B. Which means that the current which flows out of node B1 by definition is phase B current. And since the non-polarity side of winding B is connected to the polarity side of winding C, the current that goes into Node C1 is the same phase B current. And lastly, let's now move to phase C current. We know from part 3 that primary phase C current must flow into the polarity side of winding C and out of the non-polarity side of winding C. Which means that the current which flows out of node C1 by definition is phase C current. And since the non-polarity side of winding c is connected to the polarity side of winding A, the current that goes into Node A1 is the same phase C current. Okay so now that we've illustrated phase currents, let's quickly label line current. From part 3, we know that line-to-line current A will flow through line A, into the busing of winding A, and finally into Node A1. Similarly line-to-line current B will flow through line B, into the busing of winding B, and finally into Node B1. And lastly, line-to-line current C will flow through line C, into the busing of winding C, and finally into Node C1. Okay so we know exactly what's going into each node and exactly what's coming out of each node. We are now going to use Kichoff's Current Law on each node to describe the relationship between line current and phase currents. Let's start from Node A1. We can visually verify that line current A flows into node A1. 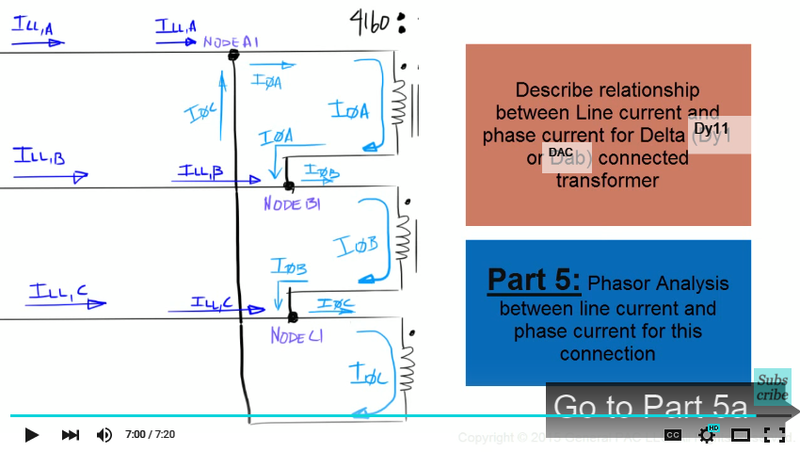 Phase Current C also flows into node A1. 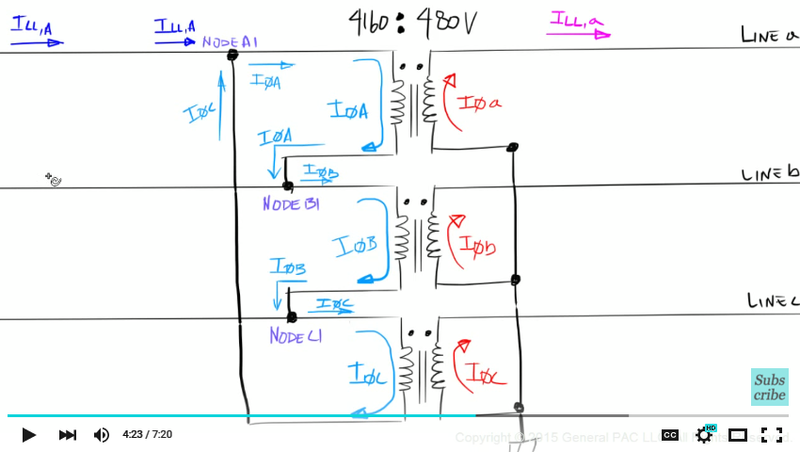 However, phase current A flows out of node A1. So when we apply KCL or Kirchoff's Current Law, we can simply express this relationship as line current A plus phase current C equals phase current C.
Or in other words, line current A and phase current C goes into node A1. Which is why it's on the left side of the equal side. 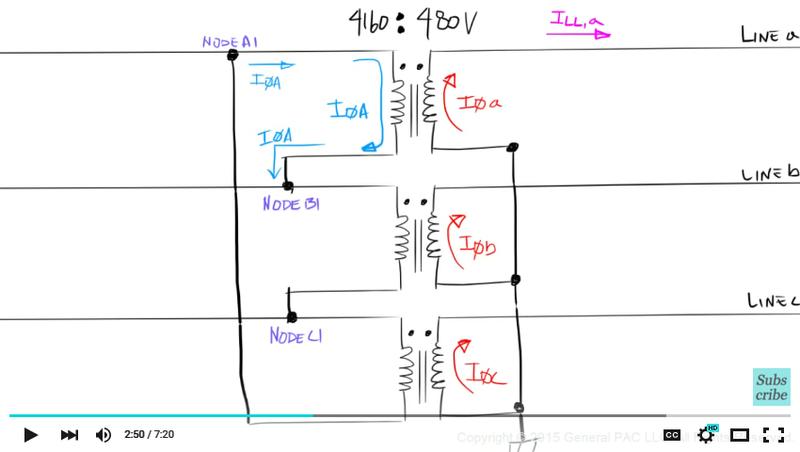 However, since phase current A flows out of node A1, it's on the right side of the equal side. Simple right? The current's that are flowing into node A1 are equal to the currents that are flowing out of node A1. Or simply line current A plus phase current C is equal to phase Current A. 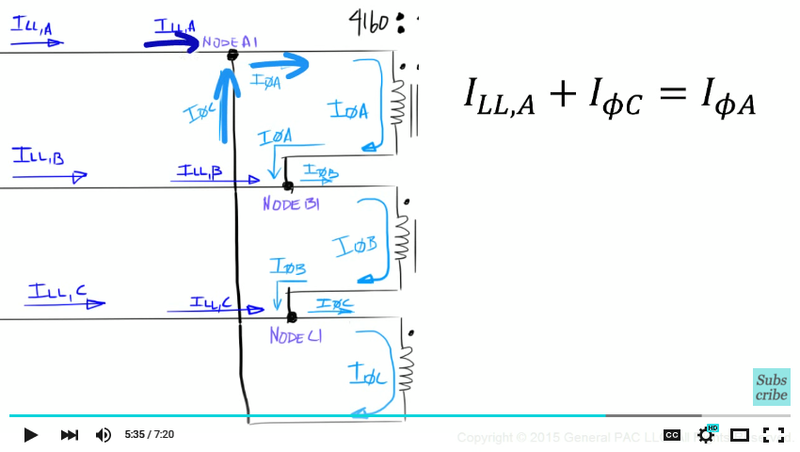 Similarly for node B1, line current A plus phase current A is equal to phase current B. Line current B and phase current A are flowing into node B1 but phase current B is flowing out of node B1. And for Node C1, line current C plus phase current B is equal to phase current C. line current C and phase current B is flowing into node C1. But phase current C is flowing out of node C1. And that my friends is how we describe the relationship between line current and phase current for the Delta transformer connection. We'll continue this relationship and perform phase analysis in part 5.